It’s finally starting to feel like summer so today I’m making a dish that has summer written all over it. A super simple Gratineed Eggplant — a dish that get raves from anyone who's tried it. I know that “gratineed” sounds like a fancy word but in reality it just means to bake or broil in au gratin style. That’s it. 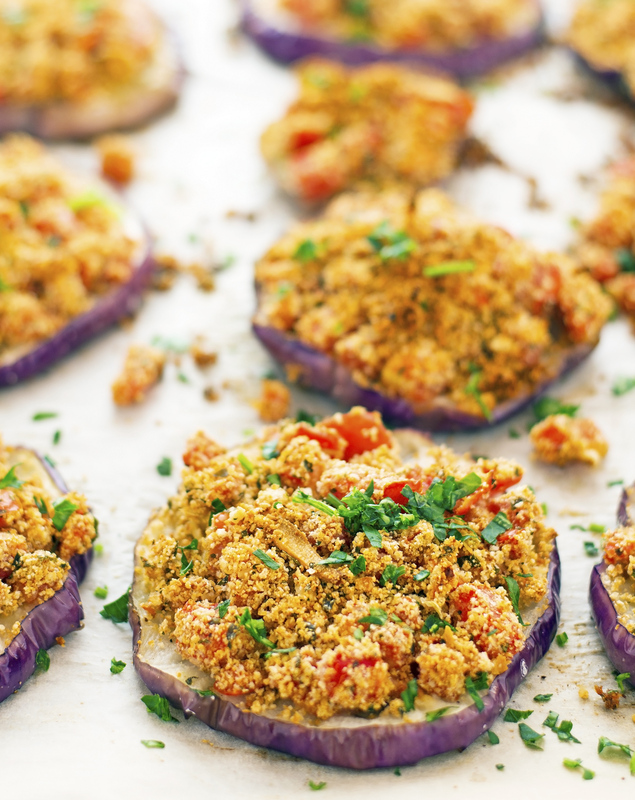 Savory eggplant slices are topped with a mixture of diced tomatoes, bread crumbs, grated Parmesan cheese, garlic, and parsley, and then baked in the oven for about 20 minutes. It seriously doesn’t get any easier than that. What I really love about this Gratineed Eggplant is that the eggplant gets soft but not mushy while the tomato mixture makes for a crusty, chunky topping. It creates a really nice texture contrast. Savory eggplant, sweet tomatoes, fragrant bread crumbs, fresh parsley, aromatic garlic, and olive oil. It doesn’t get any more summery than this. Easy Gratineed Eggplant Print this recipe! Preheat oven to 400°F (200°C) and place a rack in the middle. Line a baking sheet with parchment paper and lightly grease it. 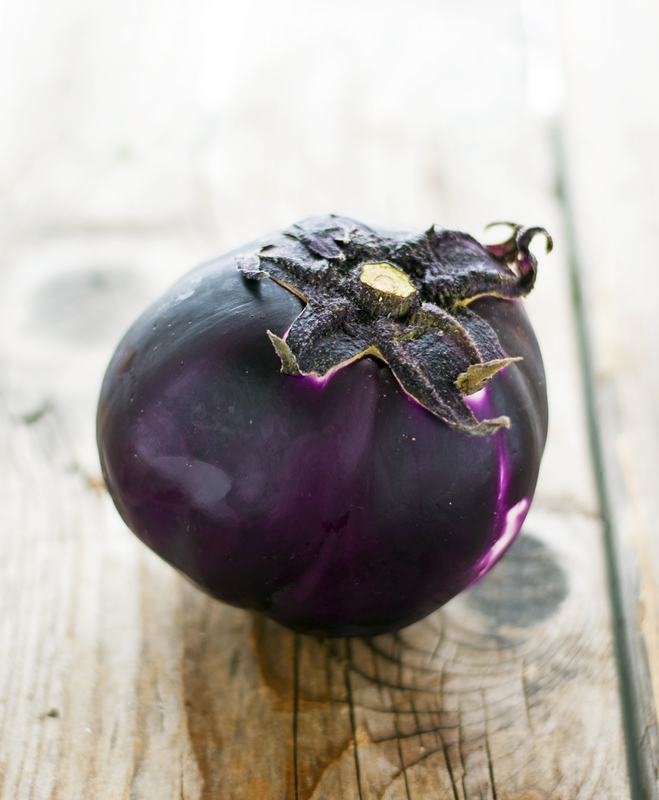 Place eggplant slices into a large bowl, add olive oil, 1 teaspoon of salt, and pepper. Toss until they are evenly coated. 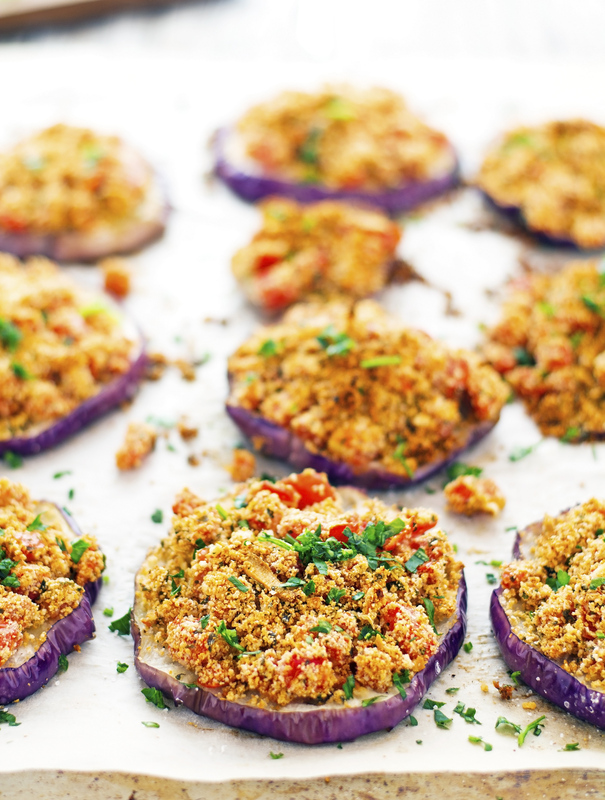 Arrange eggplant slices onto the prepared baking sheet and set aside. In the same bowl add diced tomatoes, garlic, breadcrumbs, Parmesan cheese, parsley, and the remaining 1 teaspoon of salt. Mix until fully combined. Top eggplant slices with tomato mixture and bake in the oven for 18 minutes. Turn on the broiler and broil for 2 to 3 minutes until the tops are nicely browned. Remove from the oven, let cool 5 minutes and serve. One serving yields 205 calories, 16 grams of fat, 11 grams of carbs, and 4 grams of protein. The mixture is amazing! Thank you for the idea!